M-119’s Tunnel of Trees is a 16-mile scenic road that begins in Harbor Springs and ends in Cross Village. This narrow road, designated as a Scenic Heritage Route, lacks a centerline (caution: don’t drive this route if you are in a hurry!) and traces an ancient Native American trail along a spectacular bluff overlooking Lake Michigan. Bordered by a thick hardwood forest that parts occasionally to offer tantalizing glimpses of Lake Michigan, the Tunnel of Trees is beautiful four seasons a year—so bring your camera. Spring sees morels and trillium carpeting the forest floor. Summer brings a thick green canopy that turns red and gold in autumn. In winter, views of the icy lake open up. Here’s a stunning aerial view of the fall colors along M-119! Here’s what to do and see along the iconic Northern Michigan attraction: M-119’s Tunnel of Trees. 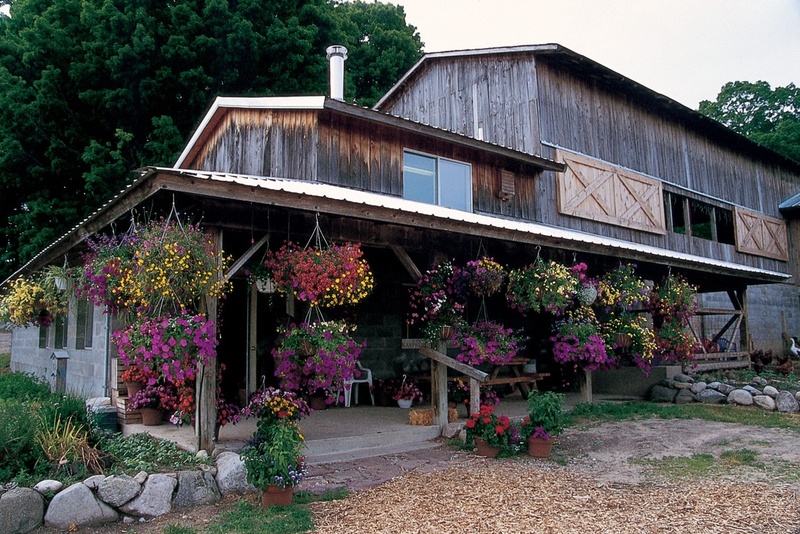 Pond Hill Farm is about four miles north of Harbor Springs. This family-owned operation has a farm market where it sells its own farm-raised produce and meats. You’ll also find a vineyard, wine tasting room and seasonal cafe. Children can pet farm animals, feed fish in a trout pond and shoot the squash rocket. Up the road from Pond Hill, turn onto Lower Shore Drive and find Thorne Swift Nature Preserve—300 feet of sandy (and public!) Lake Michigan shoreline, three miles of trails to hike, the Elizabeth Kennedy Nature Center, boardwalks, observation platforms and seasonal programs. The preserve and nature center are open from Memorial Day to Labor Day, from 10 a.m. to a half an hour after sunset. For more information, call 231.347.0991. North of Thorne Swift Nature Preserve you’ll come around a hairpin turn with a sign that bears its name: Devil’s Elbow. The daunting name is probably a translation of the Native American name that meant, “Where the Spirits Live,” local legend has it that the curve has been the site of supernatural phenomena over the years. 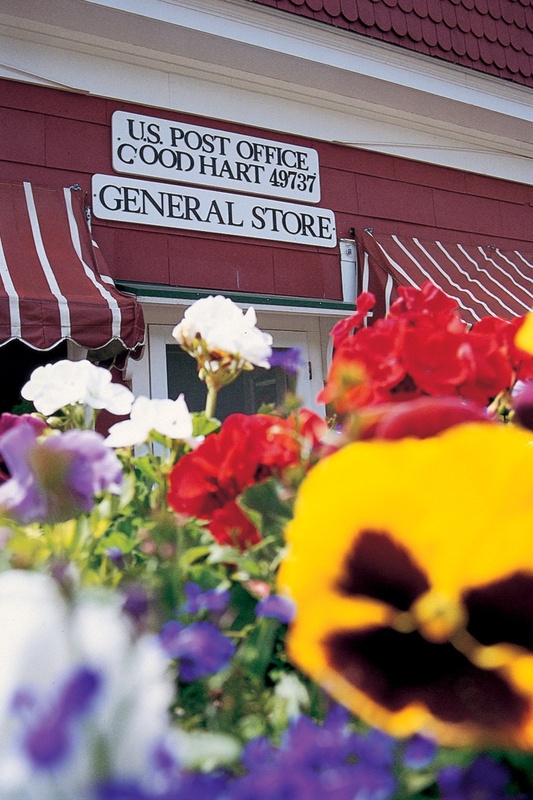 Don’t blink, because you might miss the charming hamlet of Good Hart. The red building on the left is the Good Hart General Store, a popular stop for touring bicyclists as well as motorists. The general store’s chicken or beef pot pies are available for purchase or shipping. For more information, call 231.526.7661. Next door is the Good Hart and Soul tea room serving fresh brewed loose leaf teas, coffee and baked goods. The tea room is located in the rustic furnishings store Primitive Images, which offers one-of-a-kind antique and rustic furniture as well as creative goods such as hand-crafted wooden bears, hand-loomed rugs and beautifully made jewelry. Watch this MyNorth video for a peek inside the cozy store! The seasonal gift shop is open Memorial Day through October. Explore A Studio Shop’s collection of home accessories, accents, art and more. For current hours, call 231.526.7110. You probably already spotted the sweet white steeple of St. Ignatius Church peering above the tree line in Good Hart. The church is the heart of Middle Village, the site of an old Native American settlement. To get there, take Lamkin Road from Good Hart and head down the hill. Missionaries first set up shop here in 1741. An earlier church was built in 1823 but later destroyed by fire. The present St. Ignatius Church was built in 1889. 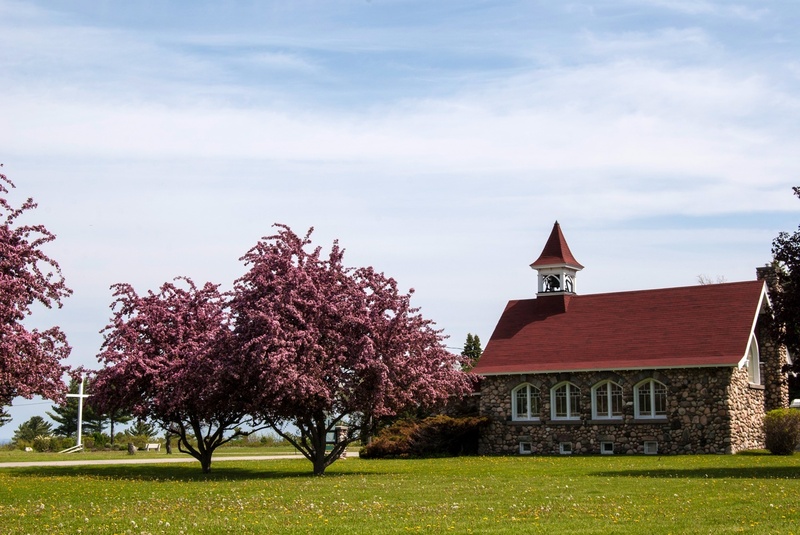 Recently restored, the church is still rife with details of its Native American and French origin—notwithstanding the Odawa cemetery that sits beside it. In July and August, the church is open for Sunday mass. It is open daily from 10 a.m. to sunset. Follow a path from the church to the Middle Village Beach on Lake Michigan—a truly sacred spot to watch the sunset. North of Good Hart, keep an eye out for the sign that marks the 18th-century site of an old tree where three tribes held council meetings. In a couple more miles you’ll come to a sign that reads L’Arbre Croche. This sign marks the site of the large crooked tree—visible for miles around because of its perch on a bluff—that, in turn, marked the Odawa settlement that once stretched from north of Harbor Springs to Cross Village. M-119 continues north for seven miles before ending at Cross Village and county road C-77, also known as State Road. Note the large white cross on the outskirts of Cross Village—it is a replica of one that the famous French missionary/explorer Father Jacques Marquette planted on a bluff here shortly before his death in 1675. If you can’t resist slowing down in front of the incredible structure built from driftwood, log, stone and yes, old stove legs,on the west side of the road, don’t. It’s Legs Inn (named for those stone legs), one of Northern Michigan’s more notable eateries. Built in the late 1920’s, the building was the creation of a Polish immigrant, Stanley Smolak. Legs Inn is still in the Smolak family and is known for its live music events and Polish American fare. The gardens and bluff view of Lake Michigan are not to be missed. The restaurant is open from mid-May into October. For more information, call 231.526.2281. Now that you’re stuffed with golumpki and pierogi, browse Three Pines Studio at the corner of Levering Road. This art gallery features the work of more than 40 Northern Michigan artists and offers classes and workshops. Outside is a beautiful sculpture garden. Three Pines also has a rental cottage in Cross Village. For more information, call 231.526.9447. For over 20 years on a mid-May weekend, thousands of riders have enjoyed a 51-mile bicycle cruise from Boyne Highlands Resort in Harbor Springs to Mackinac Island (via M-119 and a ferry). Since about half of the Zoo de Mack is along the Tunnel of Trees, the ride is a fun way to get acquainted with this legendary road. Traditionally, bikers stop for lunch at the Legs Inn in Cross Village. While the actual Tunnel of Trees makes up just 16 miles of the 27-mile long M-119, the entire highway is well worth the trip. M-119 begins off US 31 on the north side of Petoskey, just 32 miles south of the ferries to Mackinac Island in Mackinaw City. If you are bound for a Mackinac Island vacation, taking M-119 instead of US 31 will take longer—but what you lose in time will be made up for in gorgeous scenery and charming stops. Watch this MyNorth video to see what you can do on a tour of M-119’s Tunnel of Trees. Petoskey is a Northern Michigan attraction in and of itself. This small city on Little Traverse Bay offers fabulous shopping, restaurants, cottages and other lodging making it the perfect place to stage a Northern Michigan vacation. You can’t help but notice the colorful gingerbread Victorian cottages along US 31. These are part of the historic Bay View Association, a summer community founded in 1875 that boasts a world-class music festival each year, as well as other public events. Bay View has had a long list of notable residents and guests over the years, including the family of George Armstrong Custer who came to this serene enclave to grieve in the aftermath of the Battle of Little Bighorn, and a young and still unknown writer, Ernest Hemingway. Watch this MyNorth video to see fall colors in Petoskey. From Petoskey, M-119 winds into the charming Lake Michigan town of Harbor Springs. Here again, expect one-of-kind boutiques, galleries and antique shops, as well as intimate eateries. Also, find quaint cottages and other lodgings for rent. Take time to browse the shops and visit the darling public beach with its artesian fountain. Harbor Springs has a rich heritage. The first European missionaries to venture here found a Native American settlement they called L’Arbre Croche—French for Crooked Tree. L’Arbre Croche stretched north from Harbor Springs, along the route that is now the Tunnel of Trees. French missionary Father Peter DeJean founded Harbor Springs’ first Indian mission on the site of what is now Holy Childhood Catholic Church in 1889. Note how the church still dominates the townscape as in traditional European villages. By the end of the 19th century, Harbor Springs had become a summer vacation destination for wealthy resorters who traveled by steam from Chicago and rail from Detroit. Examples of fabulous Victorian resort architecture abound throughout the downtown and along the bluff above town. Watch this MyNorth video and explore the quaint town of Harbor Springs. Plan the perfect Petoskey, Bay Harbor and Harbor Springs vacation with MyNorth’s free Vacation Guide. Just click the cover!